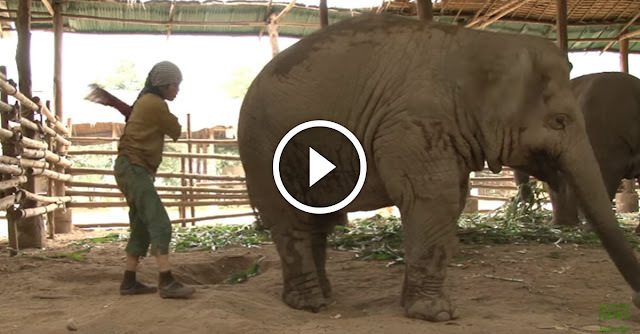 This woman swings at an elephant…Now watch what the elephant does next! Music has a certain power to it. It can completely alter our moods, relaxing our souls, and lifting our spirits. Whether it’s parents singing to their babies or people zoning out to a tune on their music player, music can sooth and relax. But it doesn’t just work on us humans, it works on animals too! At the Elephant Nature Park in Chiang Mai, Thailand, there is a special caretaker named Lek. She shows us exactly how powerful music is for her elephants. One in particular, Faa Mai, actually zones out to the sweet sound of Lek’s beautiful singing voice. Clearly these two have an incredible bond that has really been sealed with the power of music! What an amazing sight, and what an amazing woman!